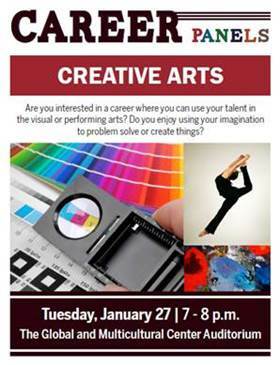 The FSU Career Center and The Advising First Center for Exploratory Students will host a Creative Arts Career Panel on Tuesday, January 27th from 7-8pm in the Globe Auditorium. Students who attend will have the opportunity to hear from faculty and professionals and learn how they connected their major to career opportunities. Panelists will share an overview of their career experiences and respond to career-related questions to help explore career options in the creative arts. Panelists will span the areas of interior design, visual art, arts administration, theatre management, motion picture arts, and more!